First Ever Pick of the Chick! Who Doesn’t Love a Hula Hoop? I was reluctant to post my first Pick of the Chick feature because I wanted everyone to have a chance to read the last post in which I interviewed the fabulous Sudipta Bardhan-Quallen. If you didn’t catch that one, check it out HERE. So…. 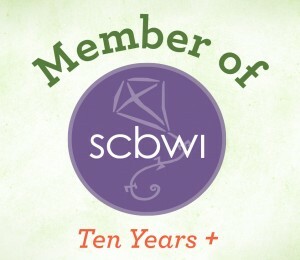 so many cool activities, so little time. What to talk about first? I picked the Hula Hoop! We know these plastic circles as Hula Hoops because that’s what the toy manufacturer Wham-O called them, but apparently the hoops, once made of vines or wood, had been around for hundreds or thousands of years. They became insanely popular when Wham-o began manufacturing them in smooth plastic, selling 100 million in two years between 1057 and 1959! And while the Hula Hoops kids use are great, they are really sized for small children. Did you know there is a simple way to make an adult and teen sized Hula Hoops? There is! And it is far easier to keep it moving when you use a hoop that is the right size. 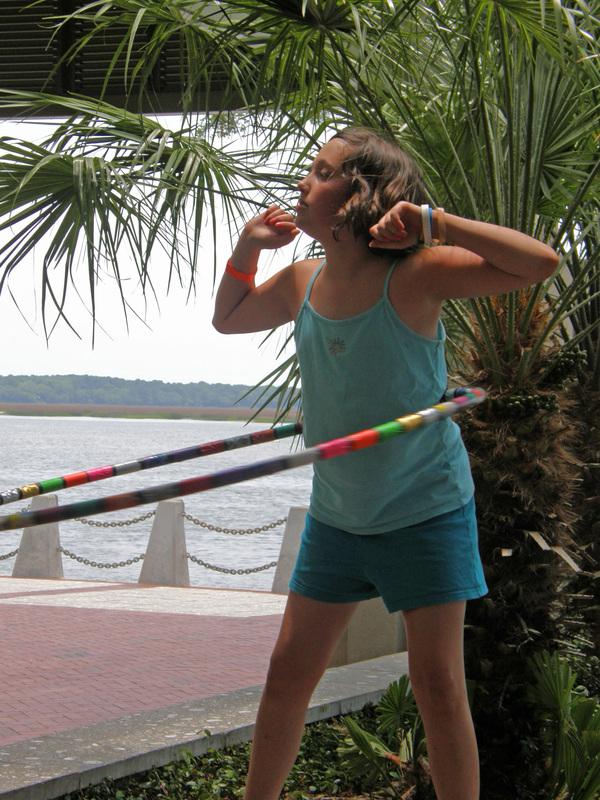 So our first Pick of the Chick feature is how to make your own Hula Hoop! I was at a workshop where a group of adults were taught to make these and they had so much fun making them and decorating them with duct tape that I had to try it. I’ve had my art students create these hoops and I’ve hosted a Hula Hoop making party for my daughter, where every girl brought a roll of fancy duct tape to pitch in and I supplied the rest of the materials. Here are the best instructions I have found for Hula Hoop making. And rather than copy them here, I am going to send you over to Jason’s Unbound! But let me give a few tips that Jason doesn’t tell you! We found the tubing for these in the plumbing section of Lowes. Because the tubing is purchased in rolls, you will want to find some friends to do this with. It’s more fun that way, anyway! If you are doing this with children, you can use a very small amount of hot water to expand the tubes. A coffee cup full works great. I usually take a thermos of hot water in and refill the cup as needed. (Adult supervision for cutting the tube is required. I do all of the cutting.) 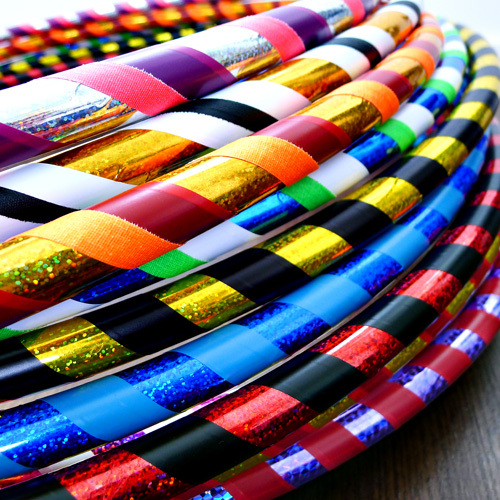 Also, we use colorful duct tape, but you can order fancy hoop tape like that used on the hoops above. 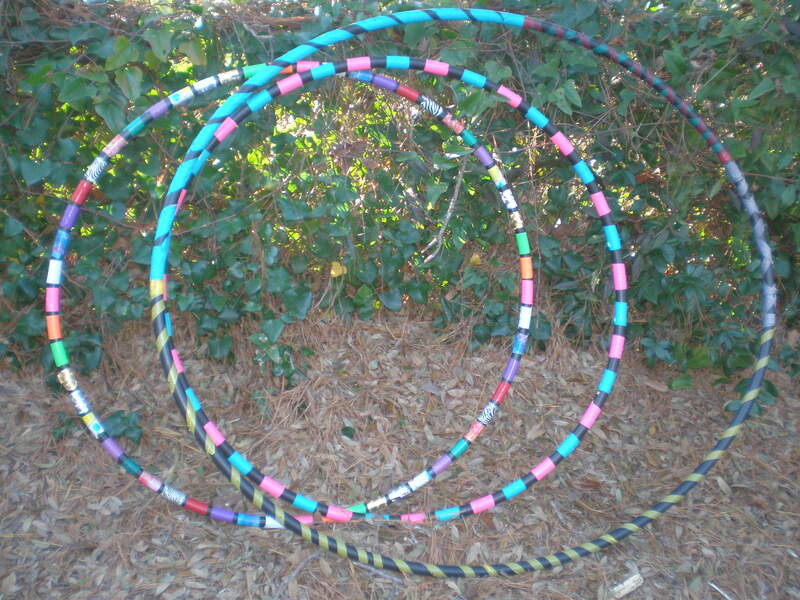 Some of the hoops we made are pictured below. Everyone who has made one of these hoops with me has walked away with a hoop in the hand and a smile on the face. Next time you’re bored, give this chicktivity a try! 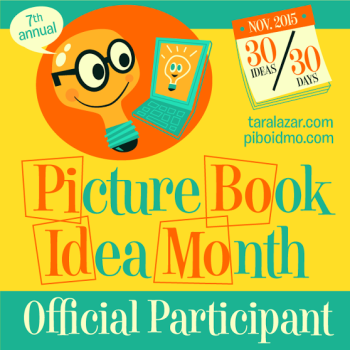 This entry was posted in Pick of the Chick and tagged activities for girls, activities for groups, activities for students, Hoop party, how to make a hoop, make your own hoop, Parties for kids, party activities. ← Sudipta Bardhan-Quallen: Nerdy Chick or Shoe Fashionista? They really are fun to make! And more economical if you do it with a group.